I love receiving packages from friends especially if it's unexpected and this one here is from my good friend Debbs who is currently vacationing for 10 full days. I do hope she's having fun in Sarawak and I will miss her funny antics online while she's away. 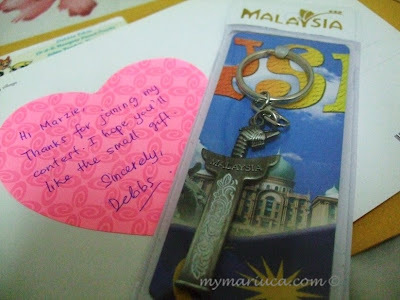 I won this lovely Keris key-chain as a consolation prize in Debbs' floral bag giveaway held some time back. Though I did not win the main prize, it's still nice to be acknowledged as one of the winners. Thanks so much for the warm gesture Debbs, I love my gift! Speaking of contests, I know I am terribly late in mailing out the prizes to the winners of my Where is Mariuca contest and I promise to sort them out this weekend. Bear with me peeps while I go through another round of posting frenzy! OMG! i can't believe i got it? I was having dinner..came back.. saw the tweet and here I am!! oh...now the emoticons are messed up..... sigh! u feel hungry Mariuca? i had tandoori ;) me too nothing much at home! GP!!! did i get FC for this one?? hehhe..
wah debbs balik kampung eh?? hehe...u don hv eggs at home? You got the chop LJ, yay another point! Yeay.. another point for me!! Yihaa!! I'm around but watching TV and blog makeover-ing in the process.. lol! I’m watching dvd and dropping ec, hey ec paid u edi or not?? Yeah 4 points edi LJ! Oh go to zzzz LJ, I’ll still buzz buzz, if ur up then can chop! have a fabulous weekend Mariuca!